One of my sweet friends asked for a Food Planning Binder from her hubby for Christmas - I gladly said I would make them one :) I didn't know how to go about making the actual "binder" part - I wanted it to be unique, but of course, still functional. I tried taking apart a binder and putting it back together with booktape and gluing fabric and such, but it was a fail. So next I decided to try and just glue the fabric to an actual binder (a used binder in great condition- yay for reusing! ), and glue sturdy cardstock paper on the insides. It worked quite well and was a fairly easy project. 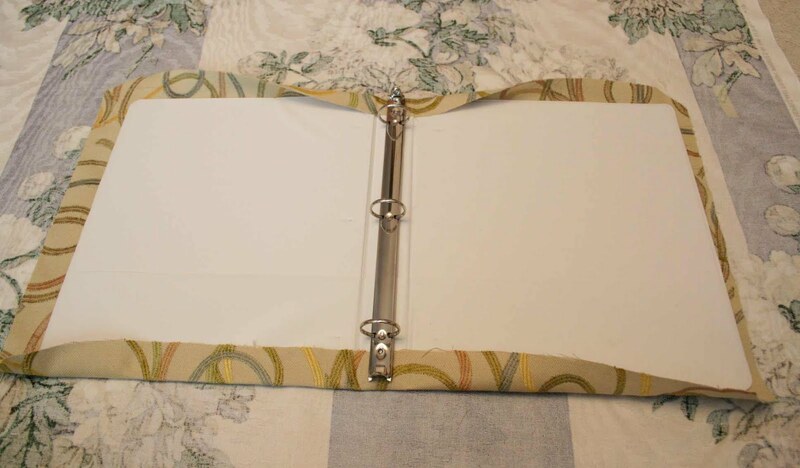 Not much is needed to make your own- an old binder that still has functional rings, some glue and cardstock paper. 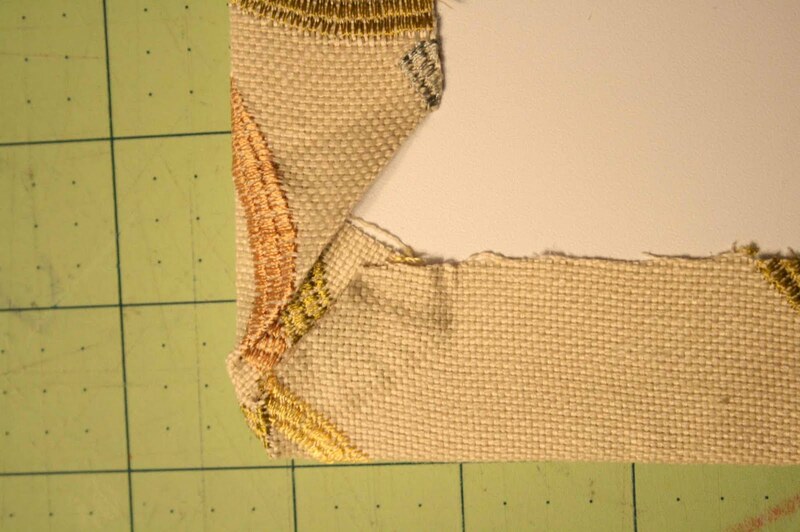 Start by cutting the piece of fabric down so that it is about 1" larger than the binder on all sides. Cut the corners off - this will make it easier when gluing. Now comes the tricky part. 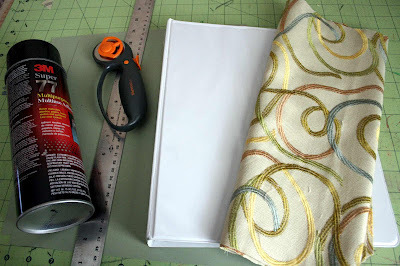 Lay the fabric wrong side up on a large piece of paper or newspaper (or fabric) that you don't mind getting spray adhesive all over. 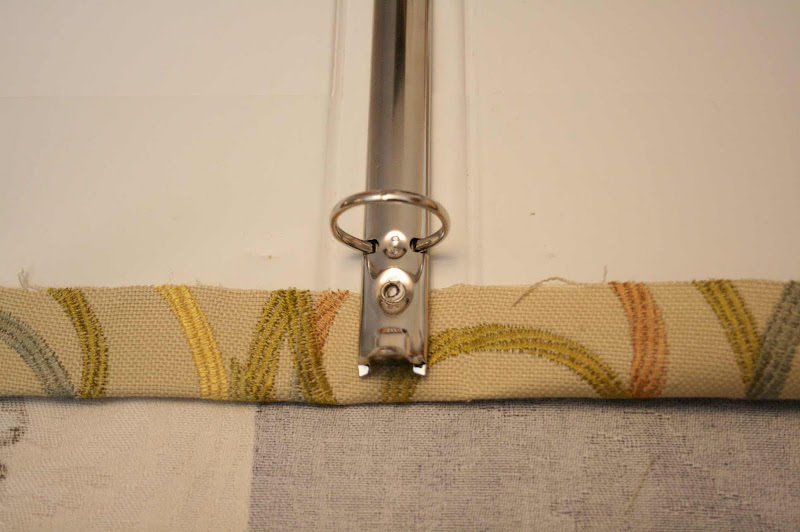 I used an old remnant piece of upholstery fabric that I had no use for. 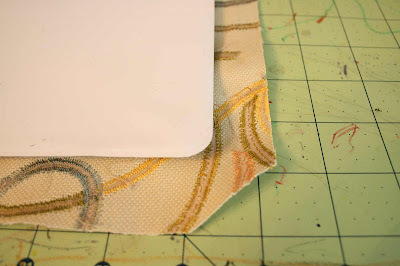 Spray the entire piece of fabric that you are adhering to the binder, taking care to get all the way to the edges (do be careful that your spray is even if you are using a lightweight fabric, as the glue can sometimes permanently make glue spots on the other side). Carefully lay the binder in the center of the now-covered-in-glue-fabric, putting the spine part down first, and then each side. 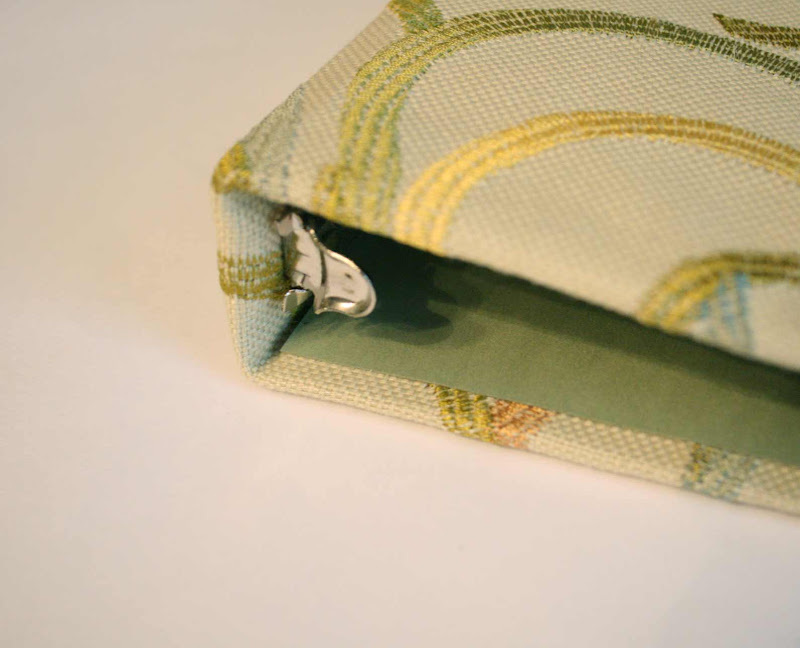 Pull up the top center and bottom center parts of fabric and carefully tuck them under the binder ring clasp (see picture below). 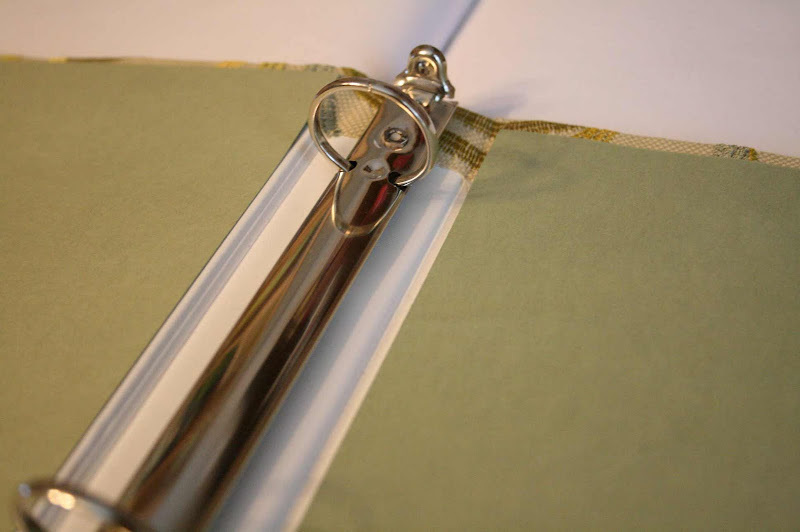 Now work your way inch by inch pulling the fabric down over the edge of the binder. 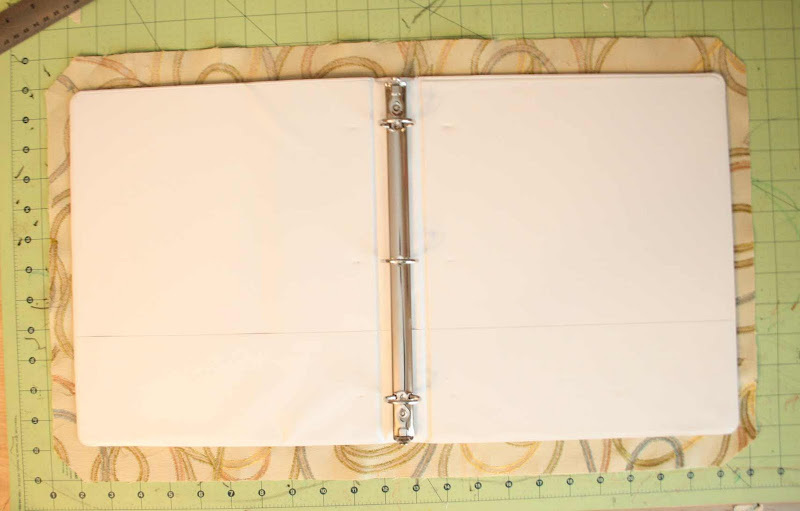 I left the corners undone while I secured all of the edges-- then wrap the cut part of the corner onto the binder first and finish securing the sides on top of that (see picture below). I decided to reinforce the corners to make sure they would stay put. I used a couple dabs of fabric glue and then put butterfly clips on to hold it for about 10 minutes. 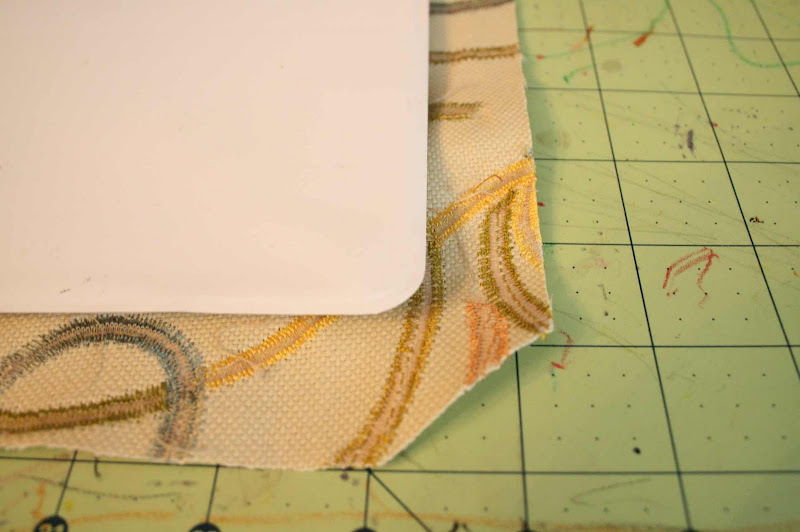 Next, I cut down the 12"x12" cardstock sheets to approximately 9.5"x11.25" and rounded the corners - this allows for about .25" all the way around where the fabric is - so you can see about .25" of fabric on the inside. Be sure to measure the insides of your binder to make sure you are cutting down to the right size (the right side of the binder ended up needing about .25" more on one side because I glued the fabric a little off). Cover only up to the fold in the binder, otherwise it won't be able to shut properly (see one of the final close up photos below). Spray with spray adhesive and secure to each of the insides of the binder. 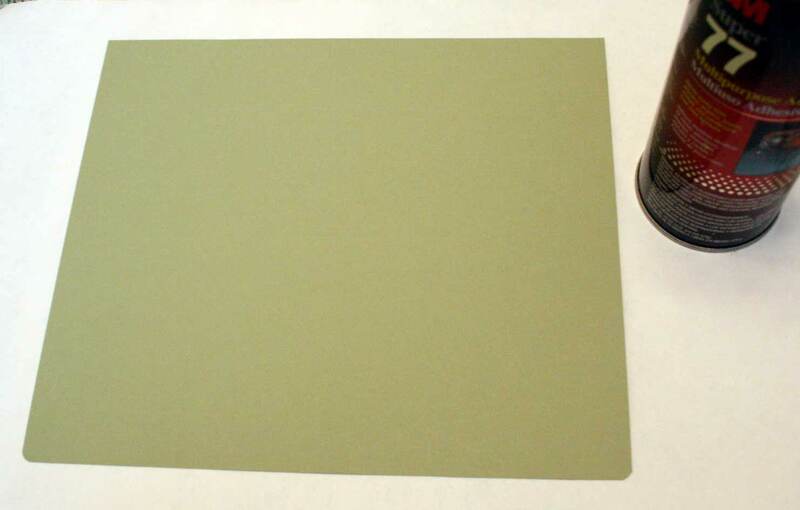 I hand-cut divider pages out of 12"x12" cardstock sheets and put blank labels on them for her to label. Looks great - very festive! The fabric is really beautiful - thanks for the great tutorial! I do think that u are a very creative person. 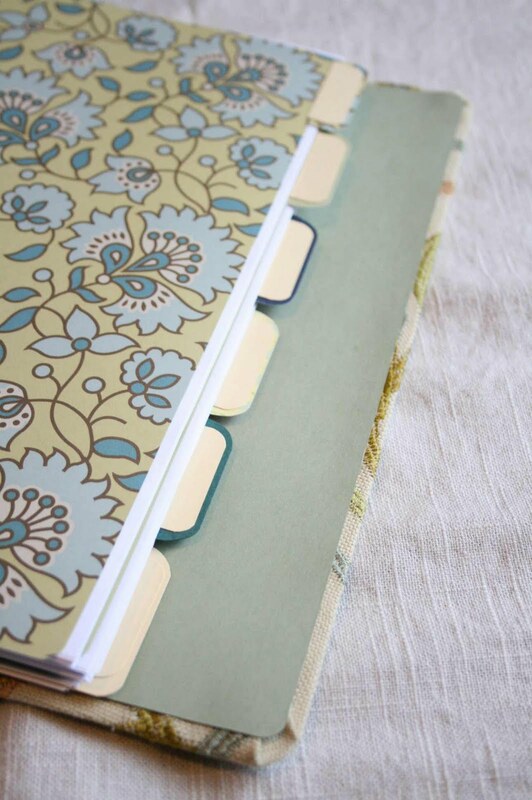 Love your journal project so much. i really love this! i stumbled across this while searching how to create a "manly" recipe binder for my boyfriend. he loves cooking! 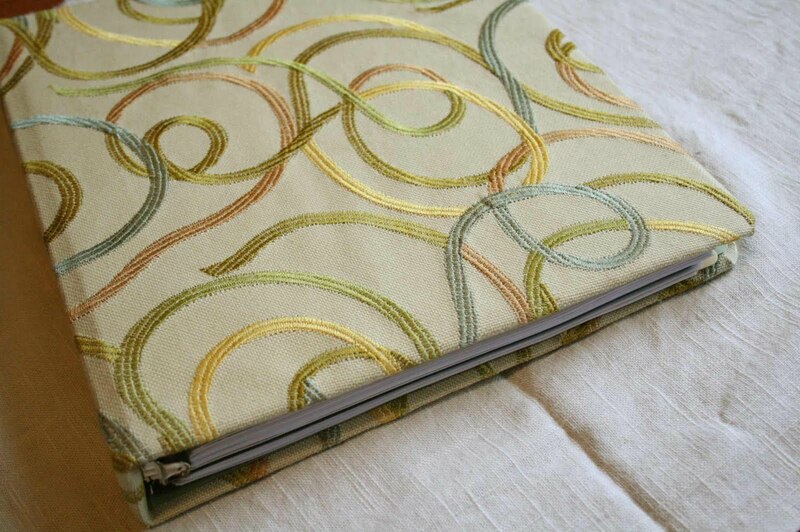 i'm planning to put fabric on a easel binder (which folds back halfway, so that it stands. hopefully the fabric doesn't crease too much and it'll actually fold. LOVE IT!!! 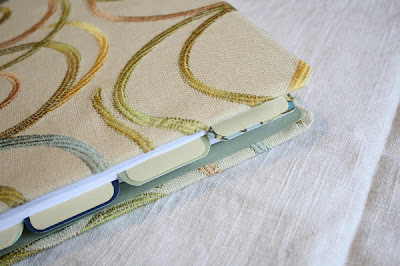 So much better than spending $30+ on a scrapbook! Thank you!!! Fabulous! I really love what you did creating a beautiful binder. I would like to feature this on my website/blog, www.deliciouslifememories.com, which is dedicated to creating your own recipe binder. 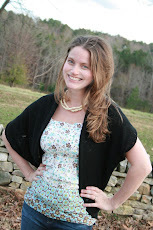 May I add a photo to our gallery and links back to your tutorial for readers? Great creative inspiration! 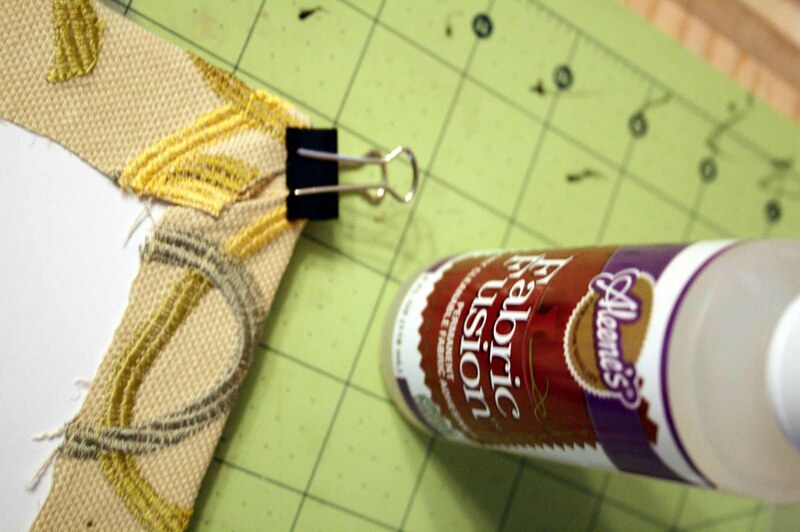 OMG Ashley, I was trying to think of a workaround to a fabric binder without sewing! This is GORGEOUS! Thank you so much for sharing! 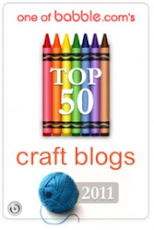 I will be following your blog! A favorite now. You Rock girl! This is the best step-by-step directions I could find! Thank you, very lovely. 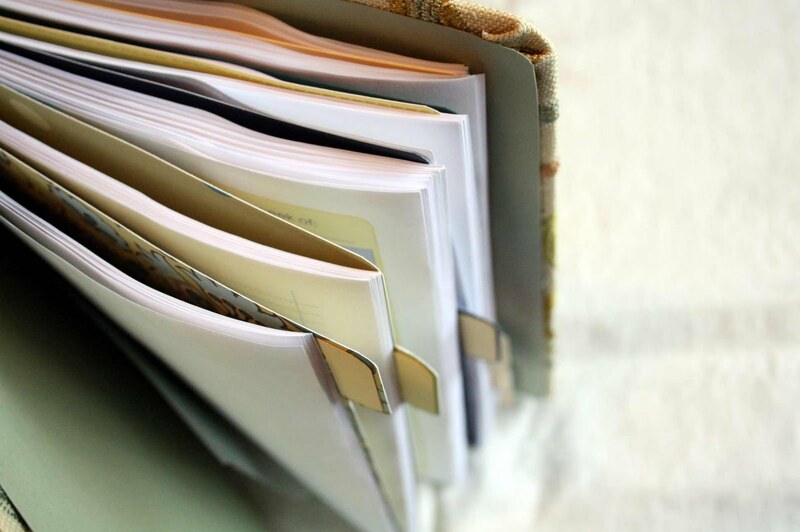 I agree with Rachel - I've been looking all over for an easy, no-sew method of covering a couple of binders and this is the best! Thank you! Thank you so much! I'll be using this to make a binder which I can hopefully keep using for some time!! !